My camera is still broken so please excuse the quality of these camera-phone pics. Top left, the product comes in a yellow paper bag; top right: The Comforter in its pink swirly glory; bottom left, I used the smaller piece; bottom right, masses of bubbles and a deep pink water colour. Those who are less enthusiastic about the brand point to the inclusion of synthetic chemicals on the ingredients list for many of the products. There are also grumbles about the strong aroma that’s the hallmark of all Lush stores, and the direct approach of their sales staff. While I understand these concerns, I don’t really share them. I like the idea of natural products but in reality, most of the products I use on a day-to-day basis contain the same chemicals found in the average Lush product – if not more. The most contentious, sodium lauryl sulphate, is a lathering agent found in the majority of bath foams, shower gels and shampoos. The company clearly display the ingredients for all products. And as for the Lush sales staff, I’ve found them super friendly and helpful when I’ve ventured in at Christmas to pick up gift sets for Lush loving pals. But in general, Lush has not tended to be a place I shop in for myself. This could be all set to change, though, if last night’s experience is anything to go by. My BFF and fellow bath fan Jo presented me with a surprise gift of two Lush bath products, the Keep It Fluffy bath bomb (geddit, geddit?!) and The Comforter bubble bar. When Joanne interrupted her trip to London this weekend to send a blissed-out text describing ‘the bubbliest, best bath ever….like a hug!”, I was desperate to try it out for myself. I thoroughly enjoyed it and my skin felt soft and smelled good afterwards. The bath also rinsed clean straight away. What about you, Lush friend or foe? The smell in the shops (and outside them) really bother me but I have some nice products from Lush. 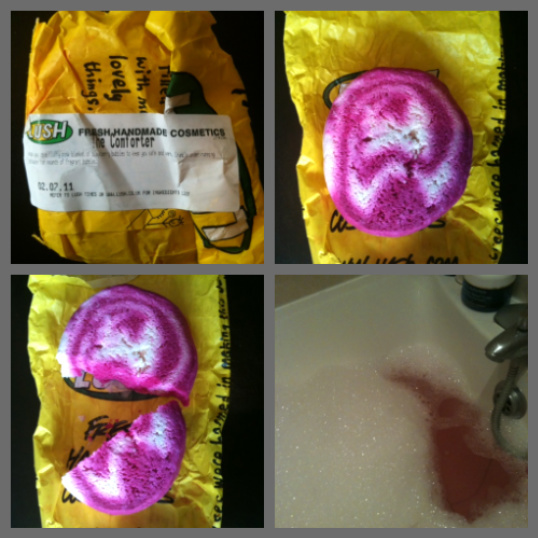 Definite fan, I love my Lush products!! I am a BIG fan of Lush - when my kids bug me for a treat at the end of a day in town, instead of buying them sugar, I bring them to Lush and get them a baby bot bath fizzer or similar. The staff have endless patience with them, even when the 5 year old insists on re-ordering the shelves by the pictures of the people who made the product rather than by the products themselves - and Mammy gets to buy herself an inexpensive but rewarding treat too. Having 9 sisters-in-law (not counting the wives of my husband's brothers - he's from a big family), I find their beautifully wrapped, high quality but not overpriced gift boxes a steal at Christmas. Glad you enjoyed your bath, Emma - I too depend on baths for relaxation to ensure sleep - am also a big fan (indeed recommender to Joey) of the L'Occitane Lavendar Bath Foam - but love the fact that after I use a Lush product, my bathroom smells delicious for days afterwards!